Every once in a while, I get a hankering to go see a quirky roadside attraction; and it doesn’t even need to be the world’s largest. Two weeks ago, we took a day trip to visit the Big Duck in Flanders, NY. Technically, the real reason was to visit family on Long Island. My aunt lured us with an offer of homemade lasagna, so it promised to be a banner day. My aunt’s cooking is worth the 100-mile trip. Heck, I would drive 500 miles for her stuffed artichokes. Copious amounts of breadcrumbs, garlic, olive oil…what were we talking about? Right…the big duck. In the 1920’s and 30’s, there were about 150 duck farms in Riverhead, NY, on the eastern end of Long Island. The farms were known for their succulent Peking ducks, and even though the number of farms has decreased dramatically as land values have increased, you can still find Long Island duckling on menus in fine restaurants. In 1931, Riverhead duck farmer Martin Maurer had a vision to create a shop — in the shape of a duck — to sell Peking ducks and duck eggs. 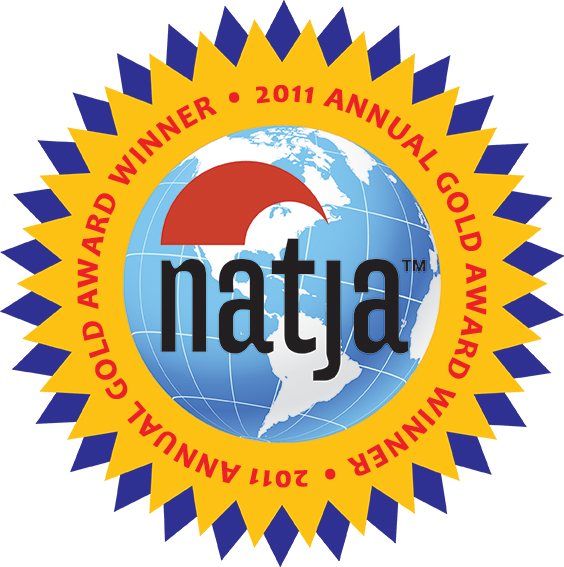 He hired Broadway set designers, the Collins Brothers, to create it. The result was the Big Duck, measuring 30 feet from beak to tail, and 20 feet from the base to the top of its head. Its original eyes were a pair of Model T taillights which glowed at night. The Big Duck was a trend-setter, as one of the first examples of roadside architecture representing and promoting a product or service. This is now commonly known as “duck architecture;” and “ducks” refer to these sculpturally-designed forms. 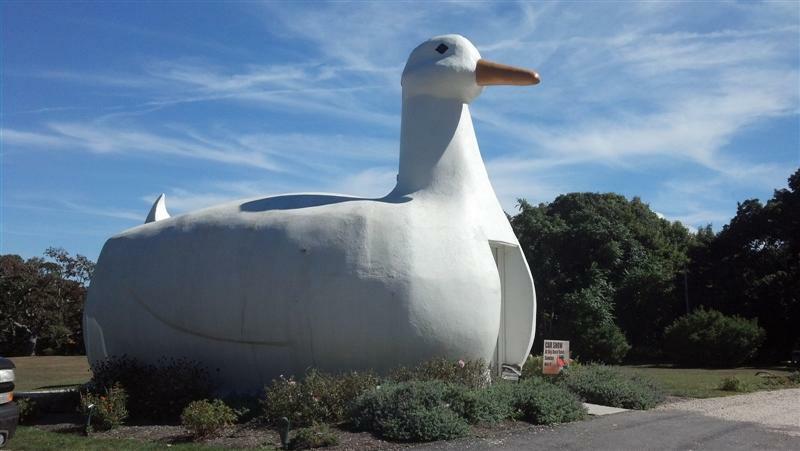 The Big Duck, listed on the National Register of Historic Places, was originally located in Riverhead, but was moved three times in preservation efforts, which reminds me of the admirable actions taken on behalf of Lucy the Elephant in Margate, NJ. The Big Duck – which I really think needs a name, kind of like “Lucy” – now sits on Big Duck Ranch overlooking Reeves Bay in Flanders, NY. It’s a public park operated by Suffolk County, so its future is secure. That’s not to say fundraising isn’t needed. Plans are in the works for a museum to be built on-site, so the Friends of The Big Duck welcome donations. We made our contribution in the form of a souvenir purchase in the small gift shop inside the duck. Yes, there’s a little shop selling “duck-a-bilia” inside the duck’s belly. 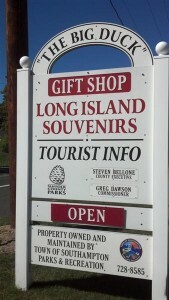 There are photos behind the counter, sent in by fans, of other roadside attractions. 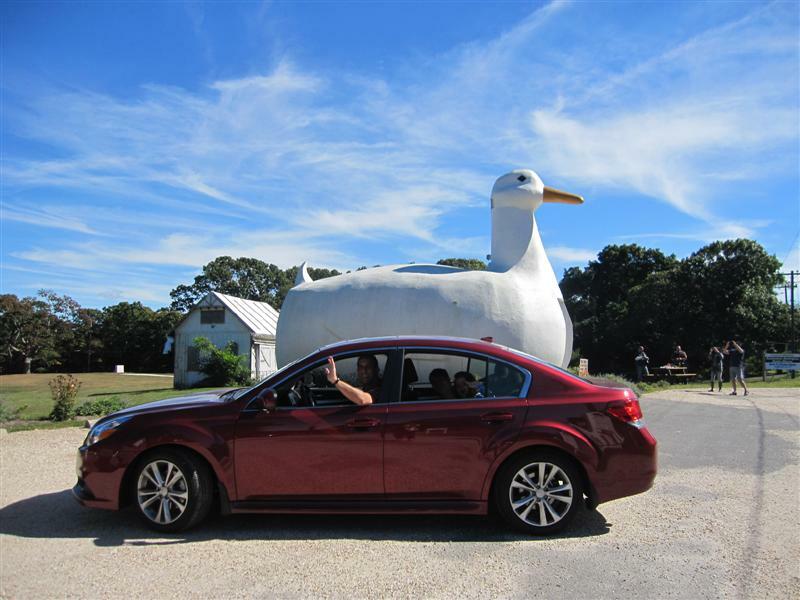 We were excited to point out several which we have visited, like Lucy the Elephant and the Haines Shoe House in PA.
Oh, did I mention that we’ve added a vehicle to the GBOGH Fleet? This was our first road trip in our new Subaru Legacy! I think the sporty red color pops nicely against the white of the duck, don’t you? Our new Legacy, purchased from the nice folks at Mid-Hudson Subaru. Did you actually start this post with “Every once in a while, I get a hankering to go see a quirky roadside attraction”??? I thought that was everyday for you? I certainly hope so because we all enjoy reading about your quirky discoveries :). I am a real sucker for big tourist attractions like the Big Duck. Must check it out the next time I am passing by Flanders, New York.